Alita: Battle Angel is another live action Japanese manga adaptation containing some very familiar science fiction tropes. It’s the 26th Century – hundreds of years after The Fall – a war which has left Earth decimated – and in Iron City scientist Dr Ido scavenges parts of a beautiful female cyborg with no memories of her previous life ad rebuilds her. He names her Alita – after his own deceased daughter – and she befriends a teenage boy named Hugo and learns about the popular sport of Motorball – a violent game which outwardly resembles Rollerball. Dr Ido is initially protective of her but there are forces within the City that seek to kill her once her true origin is known. Tethered above Iron City is the floating ‘paradise’ city of Zalem – a dream destination for many within Iron City – perhaps one that people would kill for. There’s so many themes wanting to be explored within this film which exists within a rich world created by producer James Cameron. 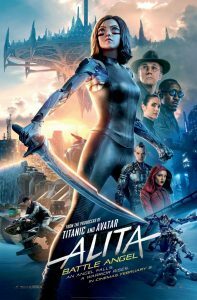 Cameron’s best single creation within this film is Alita herself who is played by Rosa Salazar who has been in some dystopian fantasy films herself. Alita is a well rounded character and the beating heart within this film, despite being a fully CGI character with distinctly uncanny eyes – a tribute to her manga origins. She’s surrounded by a generally strong cast which includes Christoph Waltz as Dr Ido, Jennifer Connelly as Chiren, Ed Skrein as Zapan, and Mahersha Ali as Vector. Although he had a hand in writing, Cameron handed over directing duties to Robert Rodriguez but he’s left unsuccessfully juggling over some heavy dystopian science fiction within a Young Adult film context. 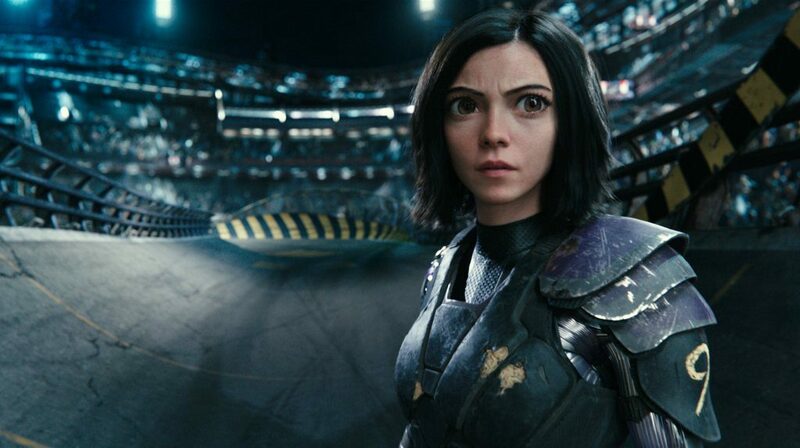 Fans of Battle Angel: Alita may be disappointed by the pulled punches although a family audience may find it more to their liking even though a lot of the world building appears to have been ditched for some character building lulls in the action. Although Iron City looks good, there’s precious little time set aside to explore what it means to be living a 26th Century life there and Alita itself is tonally mixed with a heavy leaning towards a female-led young adult franchise. The dark underbelly of the Iron City is barely explored and some of the plot points are wasted with an average performance by Keean Johnson as Hugo, Alita’s love interest. The biggest crime here, though, is the outright theft of a satisfactory finale as Alita: Battle Angel goes for a heavy sequel tease before abruptly ending. There’s some big name cameos which appear to be designed for bigger roles in a future instalment but Alita’s unsatisfactory finale lets any anticipation fall flat. There’s something about dystopian science fiction on the big screen at the moment which doesn’t appear to be hitting home with cinema-going audiences after the YA success of Hunger Games. Blade Runner 2049 (2017) was a relative flop, Ghost in the Shell (2017) had its own issues with casting, and Alita: Battle Angel is a much more violent adult property that this film only hints at. The fact that Fox have tried to turn such a bloody and violent story into a teen girl friendly movie is creditable but the resulting movie is essentially torn between young adult fiction, ultraviolent manga, sports action film, and dystopian science fiction pot boiler. All of this means that the often rumoured live action Akira movie that’s in development hell seems set to stay that way for longer. Perhaps Alita would have been better off as a glossy mini-series given more time to explore the themes that are only touched on but we wouldn’t have had the hugely expensive visuals to enjoy. The signs for Alita aren’t good. There were only 4 other people in the screening that I went to – which is not a good sign if there’s any intention to go for the sequel that this film was so clearly begging for. Summary: ALITA: BATTLE ANGEL is a sci-fi fantasy action drama in which a disembodied cyborg with no memory receives a new body and tries to discover who she really is. This entry was posted in Shooting The Breeze and tagged Alita Battle Angel, film review. Bookmark the permalink.